Molly Basile Interiors is a full-service interior design firm I own and operate in Charleston, SC. This project was a special one because it was my own home, and completing it led me to launch my business. I had been dabbling in interior decorating for years, but after designing, building, and decorating our own home I believed that starting my own business and focusing on design full time should be my next career step. What were the client’s needs and how did you meet them? Since this was our own kitchen, the priorities for the space and the budget were top of mind. We wanted open concept, clean lines, and classic with a touch of modern. I love a layered aesthetic and mixing metals. From a decorative perspective I knew the lighting and hardware would really pull it all together and create the custom look we were going for, so I chose to invest in those areas while sacrificing in others. I was influenced by a mix of old and new trends. 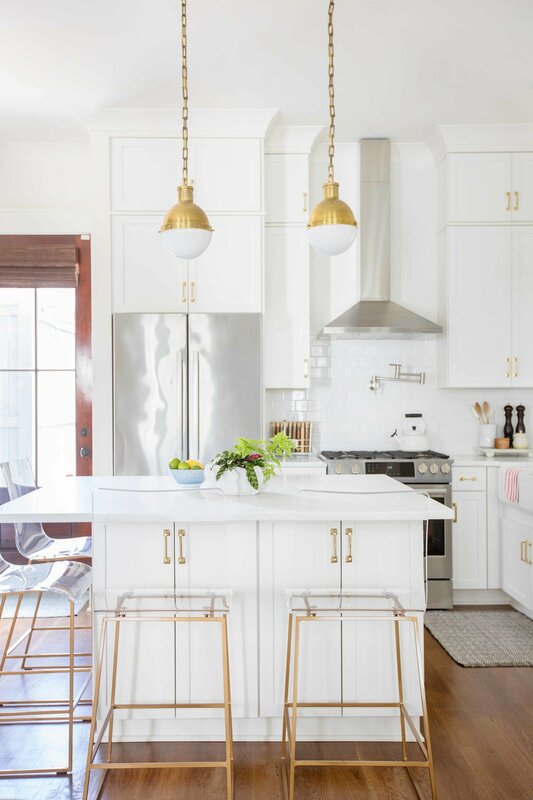 I have always loved a classic, clean white kitchen but I didn’t want it to feel sterile. It was fun to bring in the warm brass elements and metallics that are so trend relevant right now. My favorite part was mixing the contemporary brass with more classic stainless accents. 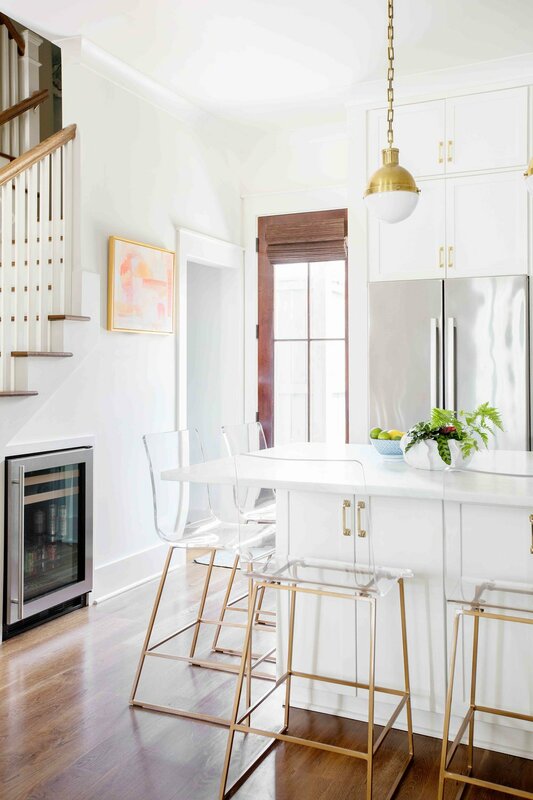 In such a small space, the mix created an unexpected, striking balance that complimented the rest of the home where there are pops of color and fun design elements throughout. With a small footprint, creating a kitchen that was functional, felt spacious, and had a “wow” factor was just an overall challenge throughout the process—but I think we managed to succeed! Our project manager recommended looking at Hamilton Sinkler when it came to selecting hardware. I knew I wanted brass, but I also love a classic look. So when I saw the DP040 cabinet pulls, I knew they would be the perfect fit. The lines and finish make such a statement. I love the quality and beautiful lines, and knowing that it will last. I am happy seeing that the vision came together, creating a beautiful space for frequently hosting family and entertaining.